Dr Stuart Thomson is the CEO and Managing Director of the Rail Manufacturing Cooperative Research Centre (CRC). 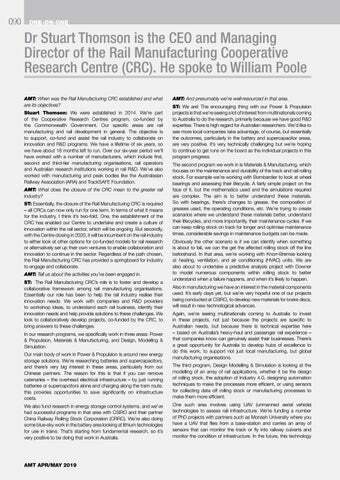 He spoke to William Poole AMT: When was the Rail Manufacturing CRC established and what are its objectives? Stuart Thomson: We were established in 2014. We’re part of the Cooperative Research Centres program, co-funded by the Commonwealth Government. Our specific areas are rail manufacturing and rail development in general. The objective is to support, co-fund and assist the rail industry to collaborate on innovation and R&D programs. We have a lifetime of six years, so we have about 18 months left to run. Over our six-year period we’ll have worked with a number of manufacturers, which include first, second and third-tier manufacturing organisations, rail operators and Australian research institutions working in rail R&D. We’ve also worked with manufacturing and peak bodies like the Australasian Railway Association (ARA) and TrackSAFE Foundation. AMT: What does the closure of the CRC mean to the greater rail industry? ST: Essentially, the closure of the Rail Manufacturing CRC is required – all CRCs can now only run for one term. In terms of what it means for the industry, I think it’s two-fold. One, the establishment of the CRC has enabled our Centre to undertake and create a culture of innovation within the rail sector, which will be ongoing. But secondly, with the Centre closing in 2020, it will be incumbent on the rail industry to either look at other options for co-funded models for rail research or alternatively set up their own ventures to enable collaboration and innovation to continue in the sector. Regardless of the path chosen, the Rail Manufacturing CRC has provided a springboard for industry to engage and collaborate. AMT: Tell us about the activities you’ve been engaged in. ST: The Rail Manufacturing CRC’s role is to foster and develop a collaborative framework among rail manufacturing organisations. Essentially our role has been to help the rail industry realise their innovation needs. We work with companies and R&D providers to workshop ideas, to understand each rail business, identify their innovation needs and help provide solutions to these challenges. We look to collaboratively develop projects, co-funded by the CRC, to bring answers to these challenges. In our research programs, we specifically work in three areas: Power & Propulsion, Materials & Manufacturing, and Design, Modelling & Simulation. Our main body of work in Power & Propulsion is around new energy storage solutions. We’re researching batteries and supercapacitors, and there’s very big interest in these areas, particularly from our Chinese partners. The reason for this is that if you can remove catenaries – the overhead electrical infrastructure – by just running batteries or supercapcitors alone and charging along the tram route, this provides opportunities to save significantly on infrastructure costs. We also fund research in energy storage control systems, and we’ve had successful programs in that area with CSIRO and their partner China Railway Rolling Stock Corporation (CRRC). We’re also doing some blue-sky work in the battery area looking at lithium technologies for use in trains. That’s starting from fundamental research, so it’s very positive to be doing that work in Australia.